I’ve done a few simple fabric piecing projects like this patchwork tunic top and shorts. Then I moved on to actual quilted projects like my quilted table runner and tablet cover. Recently, I stumbled across a super-cute fat quarter set from Riley Blake. (Sew Cherry, and on sale, of course!). The fabric set just screamed summery vintage picnic quilt and I had to buy it. I thought it was perfect for a very simple picnic-sized patchwork quilt and would be good practice before I cut into my daughter’s quilt fabric. 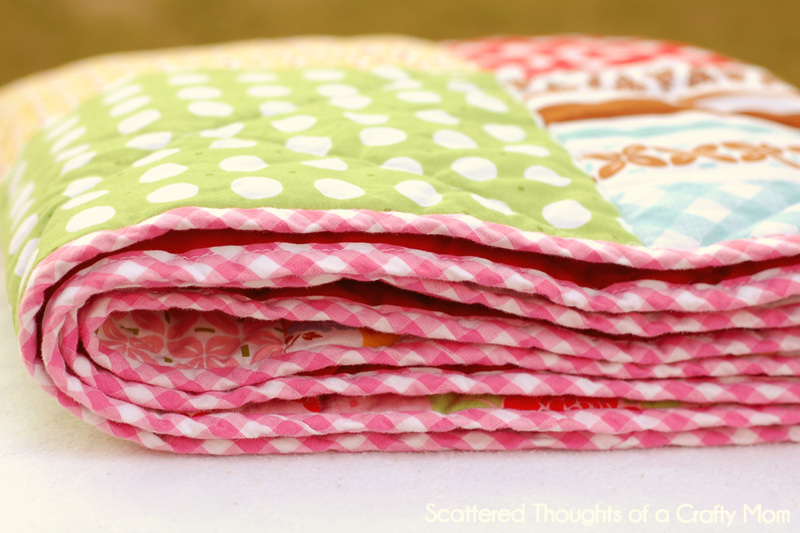 Here is the crazy part… After cutting up all of the fat quarters, I realized I had enough for two quilts. So, you guessed it! I made 2 quilts and will give one away to a lucky reader. Giveaway details will be at the bottom of the post. Give away over -sorry! Everyone has been enjoying the quilt, including the neighbors cat! When quilting, use a new appropriately sized Quilting needle. ~I used a flat sheet from Wal-mart for the back of the quilt. I was experiencing some skipped stitches on the back of the quilt and had to spend a significant amount of time picking out those stitches and redoing them. I did a little Google-ing on the subject and found a bed sheet is not always the best idea. Some sheets are woven very tightly and will cause the needle to flex and it won’t be able to catch the bobbin thread, causing a skipped stitch. The Walmart sheet is definitely woven very tightly in comparison to an Ikea sheet I have… (A twin size flat sheet from Walmart is $5 and a twin white flat sheet from Ikea is under $4.) Has anyone used one of the Ikea sheets, I am wondering if the batting shows through. Does anyone have tips or knowledge to add on this subject? ~You can use a differnt color bobbin thread so the threads on the top and bottom of the quilt will blend better. ~505 basting spray … Get some, ’nuff said! Beautiful quilt!!! I'm trying to learn to quilt, my teachers both passed away recently, I don't know when I'll be sewing again.. but I'm sure I will. What a gorgeous quilt, I can't believe it's your first one, the points are perfect! After all of the hard work you put into this quilt, it's amazingly generous of you to offer it as a giveaway. Thanks for the opportunity to win. This is lovely! I have never thought about making a quilt and you've now got me thinking!!! Pleased to be following your blog. Thanks for sharing. P.S I've posted your blog as my Blog Of The Week – had to share! Your quilt looks beautiful! I, too, am very intimidated by quilting. This design looks like it would be a great place to start. Did you just make it up as you went, or did you follow a tutorial? looks great! I just started sewing block for a quilt for my girl… 1st one ever! good to know about the sheets! Your first quilt is great! So pretty and bright. I am right there with you on the quilting intimidation! I love quilts and would love to have one that I could brag about. Maybe someday I will get up the nerve (and free time) to get one started. I love your blog and get some many great ideas from it. Keep up the great work! The quilt is beautiful! I love the colors! I love your quilt, it turned out beautifully! I have been quilting for years but I haven't tried machine quilting yet. I just got a new embroidery machine though so I am getting ready to take it on! Thanks for the inspiration! Congratulations on your first quilt! And such cute colors! This is so beautiful – I am a wannabe quilter and you have inspired me to go for it!! I am not sure why quilting scares me, but it does. I am excited to make a quilt like you did – Thanks! Beautiful! Perfect for an afternoon picnic. We were just talking the other day about how nice it would be to have a picnic quilt. I have pieced a couple of quilts but never actually quilted it, so they are sitting there, all the pieces in place but not quilted! Good job on this, love the fabric. Thank you, love the quilt! I've been thinking about learning to quilt but I'm too intimidated. You've given me hopt! LOL I mean hope,not hopt! Thanks for the beginner tips. I, like you, have had fabric purchased (even cut!) and still have not started the quilt! How long did it take you from start to finish? Maybe it's the time commitment that keeps me from getting started? So awesome of you to give one away. Thanks for that! This quilt is beautiful! Thanks for sharing your tips and giving one of the quilts away. I would like to make a quilt, but I am a little afraid to try as well. Guess I need to just jump in!! Beautiful quilt! Love the pretty fabrics you used and your helpful hints! I'd never seen the rafflecopter before, that is pretty cool…..your quilts are beautiful. I use bedsheets all the time for my own "quilts" (2 sheets with batting sewn in between) and don't have problems. Could it be a difference between 100% cotton and a blend? But I do need a walking foot for my machine…..
lovely quilt. and such fresh colors. 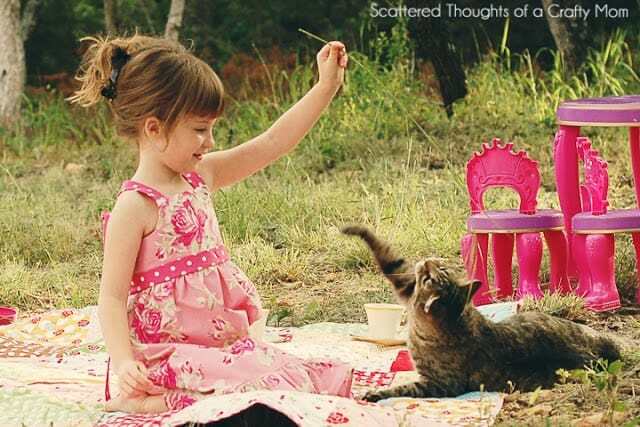 Your daughter's dress is super cute!! First of all, I have a tip to share. There is an awesome you tube video out there about basting quilts using two pieces of wood. I used this method my last two times and I'll never go back. Y'all should check it out. Secondly, from one quilter to the next… I love your quilt. I want one!!! Can I have yours? (I hope I win) and lastly, you should check out the quilt I just made my daughter. You can see it at mamajillof2crafts.blogspot.com. And please, post a comment. It's hard when you are only blogging to yourself. Congrats on your first quilt! I am a big quilter and the first one is ALWAYS the hardest. I love your fabric choices. I am trying to think if I have any tips that changed my life… Hmm. I guess it would be to stay accurate with your cutting, and ALWAYS set your seams with the iron before you iron the pieces open and it will keep everything straight! Oh and thanks for the giveaway! That is great too! You did a good job for your first time. I am trying to get one started but just don't know how! Thanks, just start with something small. Like a table runner or hot pad. Great job, love the colors! You did wonderful for your first quilt and I love the colors. How many fq's total did you use. I sure hope I win. Love it! I hope I win!! Great job! Your first quilt looks a whole lot better than my first quilt did!! I wanted to address this tip: "You can use a differnt color bobbin thread so the threads on the top and bottom of the quilt will blend better." While that is true, you have to be careful to keep the tension completely perfect, otherwise the bobbin thread will show through on the quilt top and visa versa. If the thread colors are close in color it doesn't matter too much, but if you're using black and white it can get a bit tricky. Can't wait to see more quilts from you! That quilt is gorgeous! I love it 🙂 I came over from freckled laundry after she featured your shirred sundress! What an AWESOME giveaway and beautiful quilt!!!!!! I LOVE it!!!! 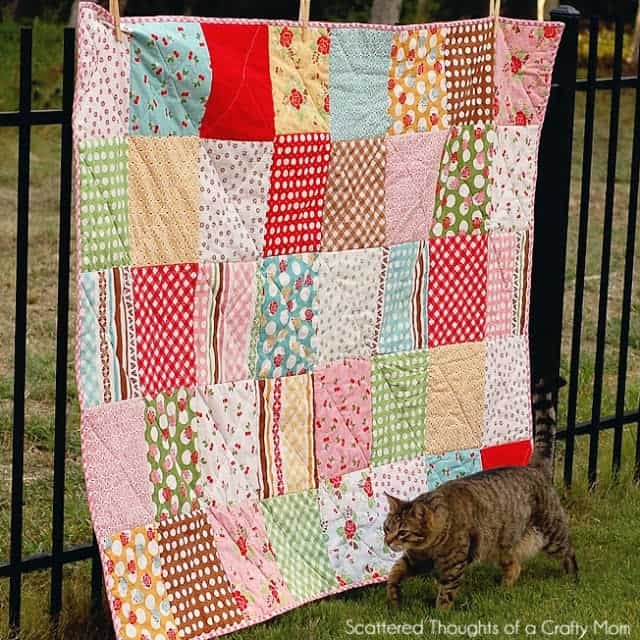 Great tips too, I want to make my first quilt this summer, I'm so excited! I loved this post! Beautiful quilt! 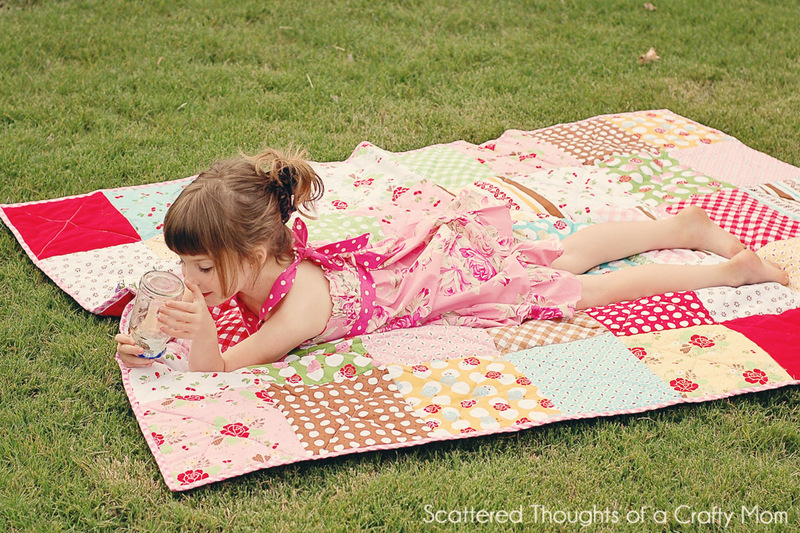 I've never sewn a quilt either but it's on my to-do list for 2012 to make one for my daughter! 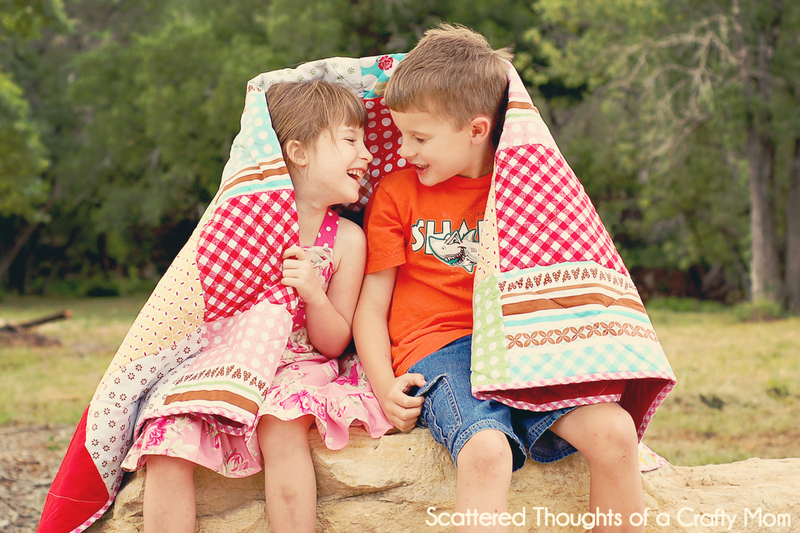 I LOVE your quilts…and I really REALLY hope to win one. Thanks so much for the chance. Beautiful! I just got my first sewing machine. Scouring the net for easy beginner projects! That quilt is stunning! I love the colors! If you have time, I would love for you to link up to the Pomp Party going on now! this is incredible! new follower and DEFINITELY entered the giveaway. Now to go get lost on your blog 🙂 🙂 🙂 Happy weekend! What a beautiful quilt! Too bad I'm in Canada & can't enter the give-away. 🙂 I would love to win. I guess I'll just have to make myself one, hey? Beautiful photos as well. I'm your newest follower. 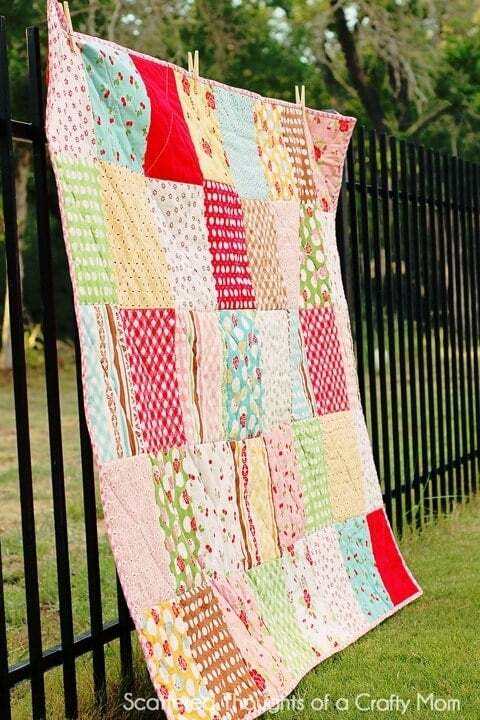 New GFC Follower Ledford Land…LOVE this quilt! THis is beautiful! How fantastic that you made 2!! I enjoy making quilts, especially when I don't have to buy the fabric. I just found your blog on craftgawker, and love this post! thanks for sharing your first time quilt, I recently made one from my sons old tshirts… its not the prettiest thing but he loves it! This turned out so beautiul! You are so darned talented! I've entered your giveaway as well of course – who could resist the chance to win such a pretty quilt? Wish I could enter your givaway. Oh well. Someone will adore your quilt non-the-less. I currently have a Crafty linky party going on, i would love you to link this project up !!! Yep, love the fabric and I may have to get some and try one of these for myself! 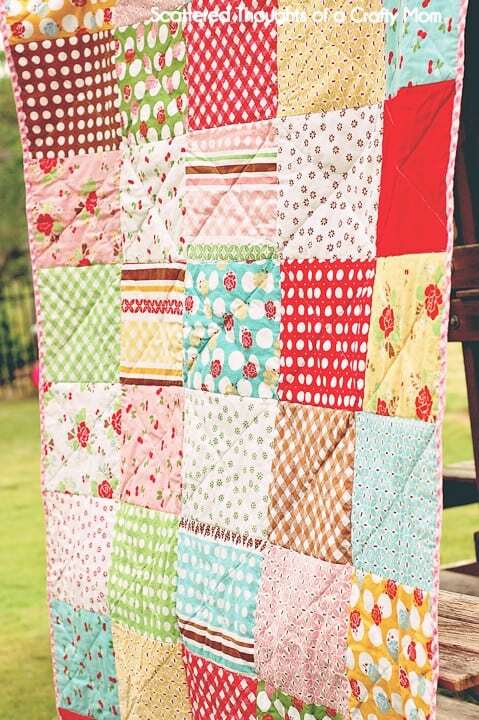 Absolutely adorable quilt, what a great giveaway! BEAUTIFUL quilt! And that was your first one? Wow! You are very talented! I just found your blog and now I'm following you by email. Thanks for sharing! I think I've entered for the giveaway. I love the quilt. What is the size of the blocks? I have a big group of coordinated fat quarters and might put them together this way. You've inspired me. Love the colors!!! I sew a lot, have made many quilts and I've never used a sheet for a back. Now I know why! I just piece fabric together to make the back. Love this quilt! So cute! what a great giveaway. I can't believe i have a chance to win such a wonderful quilt. That quilt is delicious. I love the patterns and colors … hope to win it! What an awesome prize! Thanks for linking up this week! The cuts on these fat quarters were all over the place… I evened then up the best I could without losing too many inches. They ended up being closer to 8.5 x 10.5. Your first guilt is sure a pretty one. Love all the patterns and colors. Thanks for all the tips. Thanks for sharing you white creative inspiration at Sunday's Best! The quilts that you made are amazing. I love the colors that you choose to use for the fabric. Thanks for sharing your tips, I am currently working on a quilt for my daughter. Your quilt is beautiful! I love the fabrics you used–some bright and cheerful! I really want to make a quilt–now I feel inspired! Great job on your first quilt! It's so cheerful! Jamie — for your first quilt — you did a WONDERFUL job ! Congratulations ! The fabric choices and the layout are perfect. It is very stunning — and a bias binding at that ! Way to go ! Word to the wise — never use a sheet at all for backing — if you're at Walmart to buy a sheet you are better off purchasing some of their inexpensive fabric for the back of the quilt. The fabric is most often heavier and wears much better than a sheet. Now, best choice is to purchase fabric online — somewhere cheap (Great prices at thousandsofbolts.com — I have no connection to them). Oh, I'm also a GFC follower. Love it! I wish I was that talented! Great website! I'm so glad to have found you through The Gunny Sack. I have "make a quilt" on my list of things to accomplish. It's been on the list for a long time, but after reading your post and seeing the photos of your beautiful quilt, I think I'm ready! Thanks for sharing all your great insights. Wish me luck! What a wonderful theme, you will have to come back and share the photos! Now my daughter (the groom's Mom) and I better get started quilting!!! I know this is probably too late, but I used an Ikea sheet for my son's quilt, and it has been great. It's going on 3 years old now, and still looks excellent. It is really dark blue, so maybe that's why. I haven't tried a lighter color, so I can't vouch for them. This is definitely my style of quilt. Thank you for sharing!!!! Hopefully soon I can try one too.